There is no possible way for me to review this book, this series – even. That is a statement that will appear again and again as I move forward. 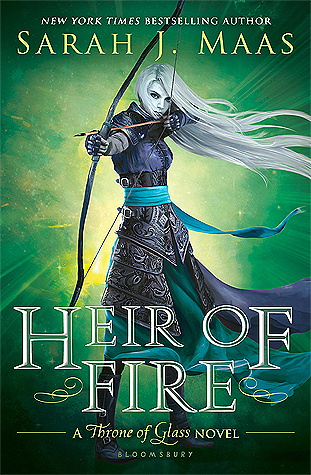 Heir of Fire introduces us to new characters, though our beloved Chaol, Dorian, and Celaena are still right in the thick of things, leaving chaos in their wake (and I love it). We are also introduced to a slew of new characters, who – throughout the course of the novel – have also wedged themselves deeply within my heart. Rowan, Aedion, and Manon are welcome additions to our crew of misfits. Heir of Fire is everything. It is everything a book should be and even then it is so much more. I think, despite everything else within this novel, Celaena’s battle with herself, with her guilt and her sheer and utter terror, is perhaps the most beautiful part of this story. We’ve always known Celaena was far from perfect, far, far from it. But, I think it is here that we see her at her lowest. She never let Endovier break her, though it did leave its multiple scars and cracks within her soul. She didn’t let the King break her. But here…. here, Celaena is doing all she can just to keep herself breathing while she rebels against herself. It was heartbreaking. Gut wrenching. There was no pity in my heart, that is never what Celaena wanted nor needed. She just needed someone to tell her it was okay to fight back – someone other than the monster she claims resides within her. I think her transformation is beautiful. I think she is fierce, she is mesmerizing, she is a force to be reckoned with that rises and rises again. It’s incredible. Overall, Heir of Fire will pull you deep into its grasp and it will not let you go. You will feel what Celaena feels, you will fight her fight to whatever end (See what I did there?). You will cheer, you will cry, you will scream and rage and curse – this book will rip your soul out through your chest. This book will break you into a million pieces. I will not be afraid, and neither will you. I leave you with a list of quotes that either made my heart sing, break, or I just plain liked them.